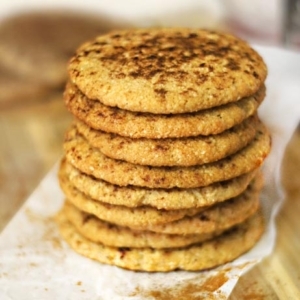 These cookies are the perfect combination of sweet and spicy and will be loved by all! Preheat your oven to 350F. In a medium bowl, cream together the butter, honey and vanilla. In a separate bowl, whisk together the almond flour, salt, baking soda and cream of tartar. Add the dry mixture to the wet mixture, and stir until well combined. Note: If your dough isn't sticking together well, try adding an additional tablespoon of butter or coconut oil. Use a rounded tablespoon to scoop the cookie dough, then use your hands to roll the dough into smooth balls. Arrange the balls about 3-inches apart on a baking sheet lined with parchment paper, or a Silpat. Bake at 350F for about 8 minutes, or until the edges are golden. Allow the cookies to cool on the pan for at least 10 minutes before removing. They will firm up as they cool! Serve warm or at room temperature, with an ice-cold glass of almond milk!